Great accesory to allow you to control your M20 tactical flashlightf while installed on the gun. 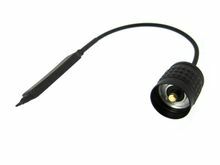 The Olight Remote Pressure Switch for the M20 Series MOMENTARILY activates whatever mode the light has been set to and is made to be used with any long gun - rifle or shotgun (not for pump action weapons). Made to be fit into the intergrated pressure switch pocket of a foregrip, the pressure switch can also be attached with hook and loop (not supplied) to any weapon that does not have an intergrated pressure switch pocket.